The band was founded in the end of 2001 and known with a concept of melodic dark death metal. Harlot Nymph was originally known as Hazazel Maut (2001-2003) and first joined by dare to die member known as Mayoui (Vox), Jamal (Guitarist), Syax (Guitarist), Nyl (Bassist) and Joe (Drummer). Unfortunately for the band, two of the members, Mayoui and Joe have to give up hope to this band due to personal issues. After a dull and dark two months without these members, the group once again awake from sleep when known with a new name more metal-like one, Harlot Nymph (2003-now). Recruiting Paul as the bass player. Altogether with this transformation, each member have to change their instrument position where Syax (1st Guitar), Nyl (2nd Guitar), Jamal (Drummer) and Paul as a bass player. Supports from all of you out there is what the group really appreciate. 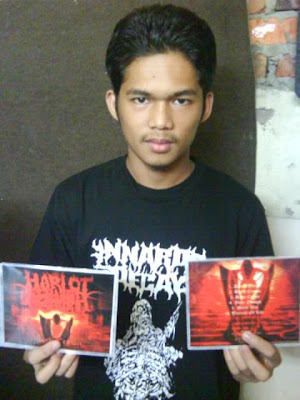 Rilisan pertama Harlotnymph pada Julai 2009. 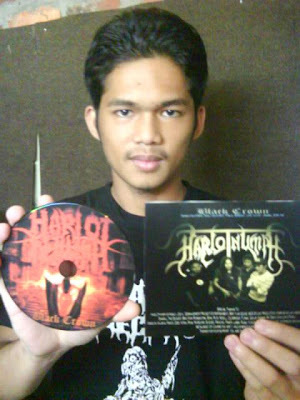 "BLACK CROWN DEMO" Rilisan ini memuatkan 6 track lagu dan satu track bonus (warrior of life). Demo ini dirakamkan di AES studio production Kimanis secara live track record. Pada Krismas tahun lepas. Thanks to Yuan Eddie (click brader ni 4 info). Lu buat kerja mmg cun bro! Demo ini djual dgn harga Rm7.oo sahaja. By pos, add RM3.oo. Cincai la. Thanks to Sharul Derangement Project for this, salute!! !